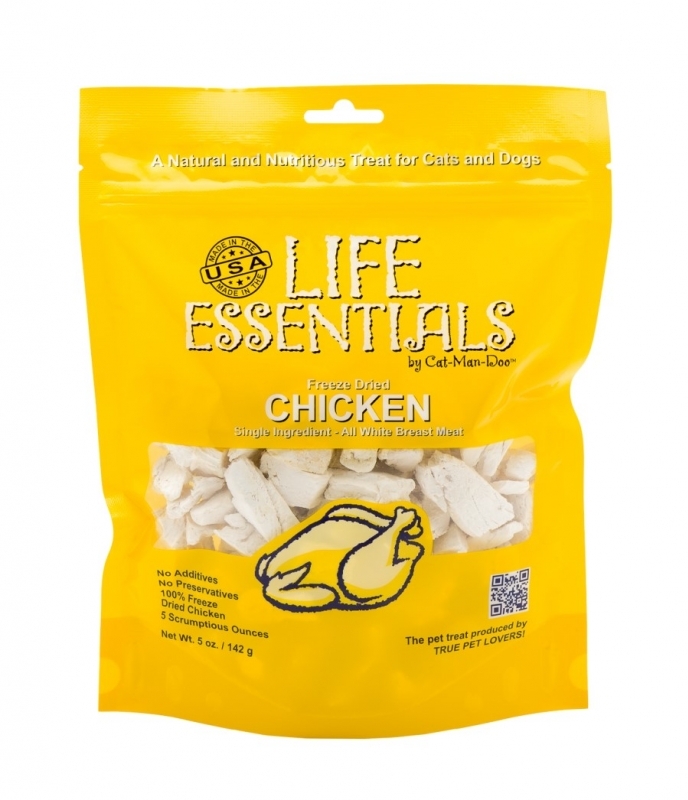 All Life Essentials products are part of the trustworthy Cat-Man-Doo brand. This human grade, FDA inspected all white breast meat is carefully sliced into strips. The strips are then fully cooked to eliminate any possible bacteria and then perfectly freeze dried without the use of chemicals, additives or preservatives. This is a single ingredient treat free of grains and fillers. It is low in fat, calories and carbohydrates so it won’t contribute to weight gain like biscuits and other high calorie treats. There are approximately 70 calories in ONE OUNCE of chicken. Packaged in a clear shaker, the scrumptious chicken is conveniently crushed and ready to sprinkle over any food. The small grains can serve as a highly effective food enhancement when added to a meal. 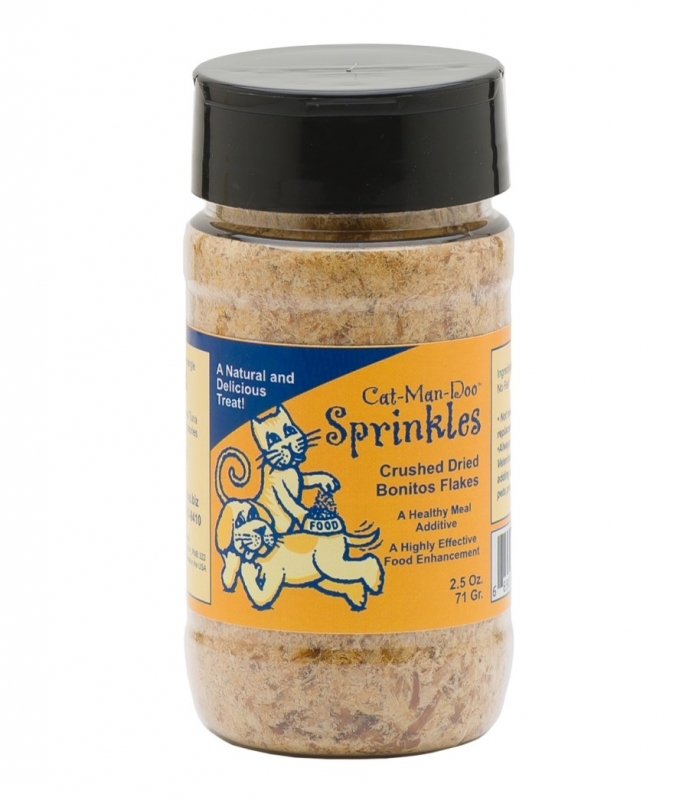 Sprinkles can be an important tool for pets on prescription diets. Prescribed foods can be bland and unappetizing to a cat or dog who may have little appetite to begin with. However, without these prescription diets, a pet with poor health may not live as long. Many veterinarians suggest topping the food with Sprinkles in order to revive appetite and to encourage a renewed interest in eating. 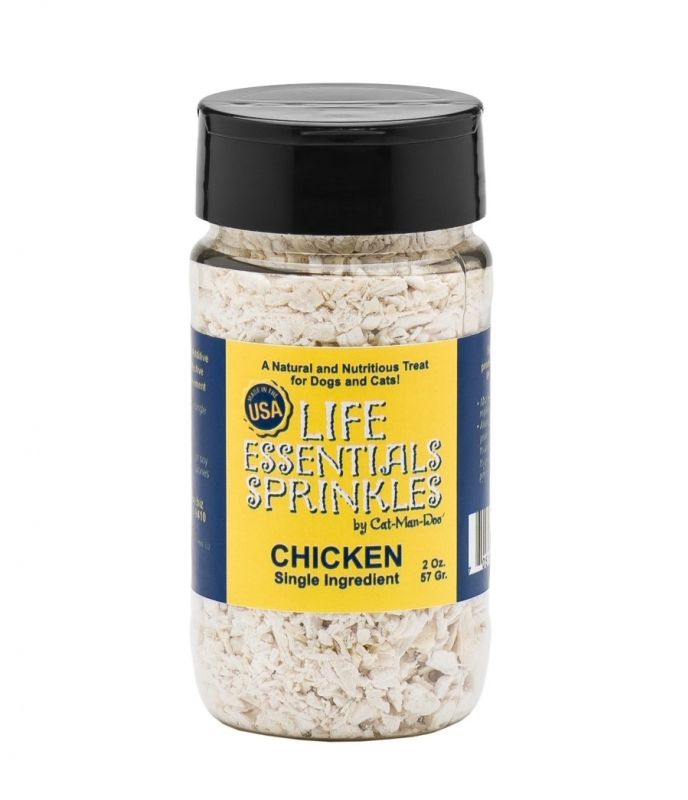 We have been providing Life Essentials Chicken Sprinkles to veterinarians for many years. As a precaution, we always recommend that you consult your veterinarian prior to adding anything to your pet’s prescription diet. THE PET TREATS PRODUCED BY TRUE PET LOVERS! Oh no! I ran out of sprinkles a few days ago. 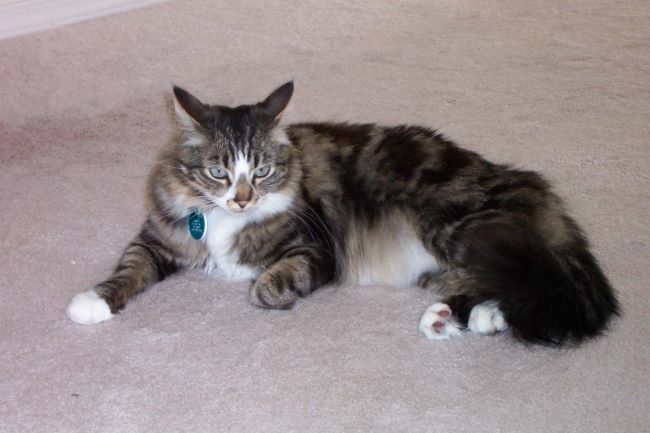 My cat, Mya, goes to eat and looks at me with a look that says, " Hey, forget something?" Reordered and since this store ships so quickly I'll get them soon. Gotta plan ahead next time. She loves then. Thanks Cat-Man-Doo for quality products at a great price and fast shipping. Much appreciated by both me and Mya. It's one way to get Spike to eat. He's got kidney disease and we're doing all we can to keep him going. As long as it works. The problem is keeping the rest of the clowder out of his plate! My cat just loves these sprinkles. If I don't put them on her food she looks at me like " Hey, where;s my sprinkles" and she waits to eat until I put them on. A great product. I love these because my cats love these. In fact, one won't eat her food unless it's been "garnished" with sprinkles! Yes, I know that they are spoiled. Service is great - easy to order and fast delivery. I will keep buying these as long as needed. Login or register to leave a review for this product. Don't let our name fool you. 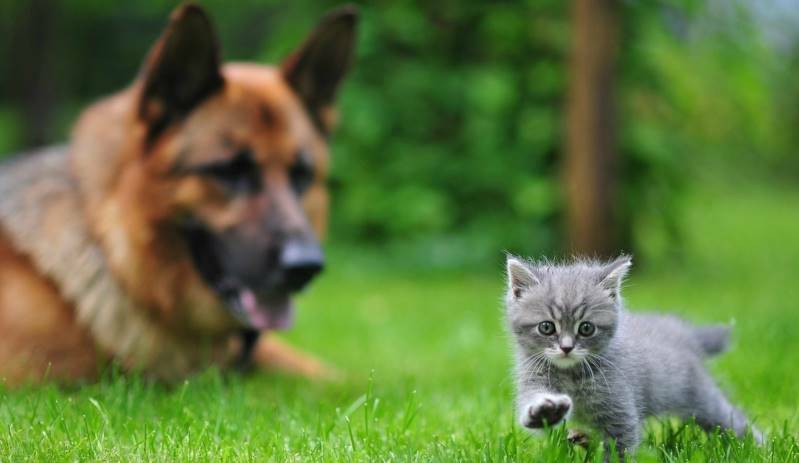 Although we are Cat-Man-Doo, your dog will love our products too! We have a store near you. Search our complete database of retail locations. If you wish for your favorite Pet Store or Retailer to carry Cat-Man-Doo, just drop click below!